The bilberry (Vaccinium myrtillus) is a round, flat-topped, delicious tiny fruit that grows in the wild, and is seldom cultivated. The berries grow profusely on small, wiry shrubs, mainly on high ground in the north and west of the British Isles. Due to its small size and blue color, it is often mistaken for a blueberry. The bilberry tastes quite different. The bilberry is a very deep blue—not unlike a blueberry—and has a slight grey bloom to it. The taste is completely different from a blueberry, as the bilberry is very acidic, and though it may be eaten raw, shines when cooked and used in jams, jellies, and pies, as well as sauces for game and other meats. It is as nutritious as blueberries, but whereas blueberries are easy to grow and are found around the world, bilberries are much rarer. Bilberries are also known as European blueberry, blaeberry, whortleberry, bulberry, whinberry, winberry, trackleberry, huckleberry, and fraughan in Ireland. Bilberries are usually found on the high ground and also in hard to reach places. 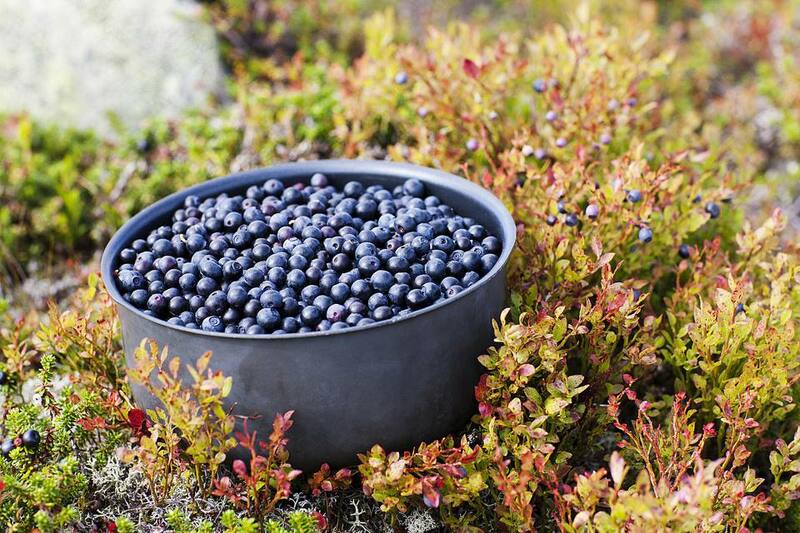 It is, for this reason, you will rarely find bilberries in large quantities—or perhaps at all—in the store, though a few northern supermarkets do make them available when in season, which is very short, between August and September depending on the weather. If you are lucky enough to get your hands on some, there are a few recipes that will benefit from the addition of bilberries. When eaten raw, the bilberry is rather acidic—but once they are cooked with sugar, they become a delicious, deep-flavored fruit that makes a delicious jam, pie filling, or compote. These berries contain a lot of juice which is released when cooked—they may need to be drained before using in a pie if you want to avoid a soggy bottom crust. Bilberry pie is a classic British dessert loved throughout the North of England, particularly in Yorkshire. It is delicious served warm with thick cream or a good vanilla ice cream. Since bilberries can be used in place of blueberries, any recipe that calls for cooked blueberries is a good option—from muffins to crumbles to tarts and cheesecakes. Just remember that raw bilberries have a much more tart flavor than blueberries so swapping them in a recipe when they're not cooked will create a noticeably different taste. Whether the forager or if you are out on a walk and come across bilberries, you can pick the berries one by one, but do not expect to be filling pots of jam with your lot—you'd have to be there all day picking berries. If you do wish to have enough for cooking and baking, then you should use a bilberry scrabbler, which is a type of scoop with narrow tines like a fork. This tool is scooped through the bush and collects the berries easily and quickly.